This January, CLOSET is coming to Sydney for the very first time. On the Australia Day long weekend, CLOSET Summer Camp will bring one of Melbourne’s best gay times to Goodgod for ONE NIGHT ONLY. 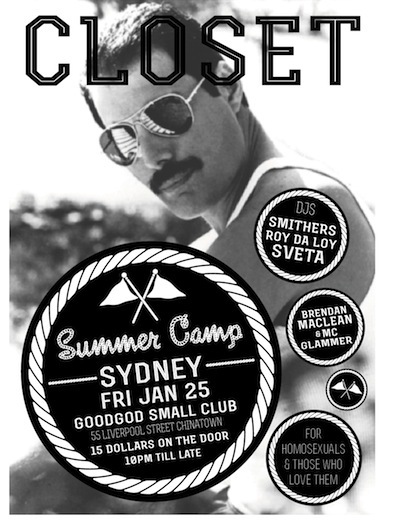 For Sydneysiders and the uninitiated, CLOSET is a disco for homosexuals and those who love them. On the first Friday of every month, in the heart of Melbourne’s Fitzroy, CLOSET brings together hundreds of gay boys and girls of all persuasions – fags, femmes, queers, queens, butches, bears, bis, curious straighties. Like all their parties, CLOSET’s Summer Camp is co-ed, welcoming gay boys and their Sapphic sisters – and their friends – to come together. While Melbourne and Sydney do things a little differently – pots vs schooners, AFL vs NRL – CLOSET want you all to make love not war. CLOSET will be pulling out some of their favourite DJs from both sides of the border to grace the decks on the night playing old-school 90s house and hip hop right through to nu disco and camp classics. GOODGOD are very happy to help CLOSET pitch their tent in the Danceteria!